Fall of 2013 was going to be epic. We'd already discussed a few options that would give us very long days in the park. Milner Pass to Bear Lake was one of those ideas, and another was a variant of Mummy Kill starting and ended at Lawn Lake TH. Of course neither of those happened due to the floods. Mount Tileston was something we'd planned on adding to our long day in the Mummy Range, but with snow now becoming a factor, we decided to make it a destination in and of itself. 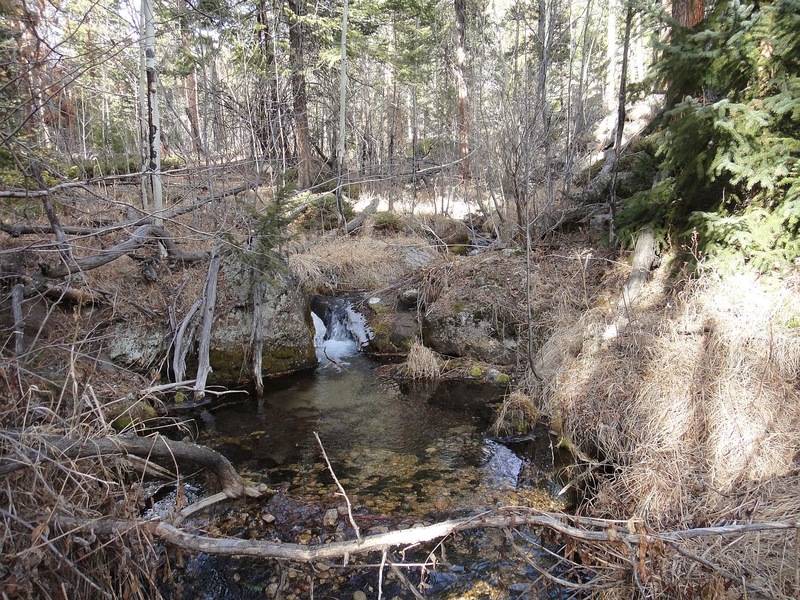 I'd read that both the Lawn Lake trail and Ypsilon trail had sustained some damage from the floods. Here was the first real sign of it. Where the trail ends. 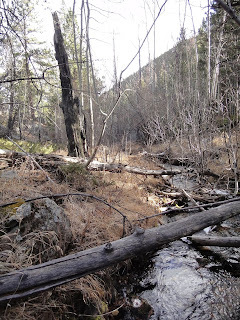 Of course it was easy to bypass it, and there is already a little bit of a social trail developing through the forest. We stayed on the trail past the sign for Cutbank campsite, and for a time after as it took two switchbacks up. 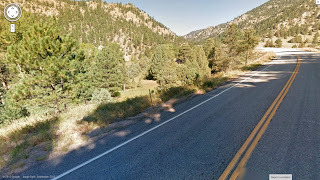 We then made our way east, starting up the steeper slopes of Bighorn Mountain. This time was much easier than last, and we were soon nearing the top. Cloud watching near the summit of Bighorn. Soon after I saw the low clouds on the right absorb the summit of Longs. Peaks of the divide and trail ridge road. Summit cairn in front of Fairchild, Hagues, and Mummy. Though the day was cold, it didn't feel too bad until the wind hit you. After a quick snack in a wind break, we set off downhill towards Tileston. Chiquita and Ypsilon in winter clothing. After summiting Tileston, we descended towards Potts Puddle. This small body of water looks to be easily accessible from the Black Canyon Trail. A very peaceful and off the beaten path to enjoy lunch in the summer, we now circled almost the entire way around it to find a place to eat that was out of the wind. Ice nine and Mummy Mountain. Some wipsy clouds over the puddle. I'd never been to Lawn Lake before. Though the recent floods were bad, it is hard to imagine what things would've been like to witness the dam break and make this canyon in minutes. This event provided the impetus to remove the dams at Pear(also), Sandbeach, and Bluebird(also) Lakes. At Lawn Lake, Fairchild Mountain behind. With no trees to provide cover, the wind was absolutely ripping. After a few pictures, we turned back to find our footprints from mere moments ago completely obscured in places. As we made our way back, we came upon the tracks of someone else who had made it most of the way to the lake before turning around. 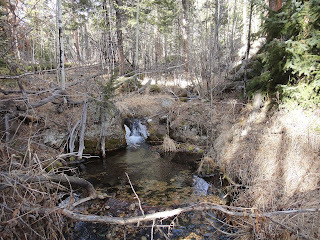 I walked over to the creek to check out the Ypsilon trail. Here is where the bridge used to be. You can see the trail center left. There were footprints on it, so at least a few people made it across. Be very careful if you attempt this! The canyon now looks even deeper. We made it back to the car after nine and a half hours and started on our way down. Due to some road work, we stopped on 36 right around Big Elk Meadows, and I was able to get this photo. Here is a very similar before view from Google Maps. Again, sobering to see the amount of destruction driving down 36. Bighorn Mountain offers a great vantage point to look into various parts of the park, most notably the Mummy Range with a unique perspective given on the Longs Peak area. I feel that Bighorn would offer those of you looking for something off trail and a little bit more challenging a good option. And while you're there, Tileston adds some distance but not much more difficulty. As I've said before, it would be fun to try these peaks in summer just to get a good idea of the difficulty in better conditions. I found Bighorn to be easier this time, while still in up to knee deep snow. Bighorn Mountain, 11463 feet: 3.9 miles one way, 2923 foot gain. Strenuous-. Mount Tileston, 11254 feet: 5.8 miles one way, 2714 foot gain. Strenuous-. Potts Puddle, 10900 feet: 6.5 miles one way, 2360 foot gain. Moderate+. Brief? Well, I'm not sure I would call a nine hour hike brief, but I had a smile on my face the entire day. Or was that a grimace of pain? The goal for the day was a traverse of Lumpy Ridge, starting at Gem Lake on the east side and ending at the Black Canyon trail on the west side. We met up in Lyons at 5, and were on the road shortly after. I'd been in Lyons several times over the past week as some of the mountain biking trails have opened up, and the destruction there is mind blowing. We wanted to see what 36 and Estes looked like, but of course it was hard to see anything in the dark. We made it up the canyon and to the trail head in only half an hour. A few minutes of organization, and we were off! It is always fun to see the sun come up from the trail. Only five more weeks until the solstice and the days will start getting longer again. Along the way we stopped by a feature called 'Paul Bunyans Boot'. It is easy to find as the trail goes right by it. Not too much later, we found ourselves at Gem Lake, mostly iced over. Despite it's proximity to the trail head and ease of access, I'd never been here before. Interesting looking rock around the lake, and really in the whole Lumpy Ridge area. We stayed on the trail for a short time longer, just until it started to loose elevation again. Then we turned west and started up some slabby stuff. We made it to the summit east of Gem Peak just in time to catch a few minutes of Alpenglow illuminating the mountains in the background. The garish magenta color is caused by refraction of sunlight by airborne particles before the sun actually crests the horizon. It looks fake. From this high point, we had to work our way down and decided that the south ridge of Gem Peak looked like the best non-technical option to get to the top. Like all off trail hikes, there was alot of up, down, and around on this day. I note that Gem Peak is not listed in Lisa Fosters book. I wonder why that is, as it is unofficially named but ranked. First sun streams through the mountains to the east and hits the valley of Estes Park. The summit of Gem Peak. Our shadow stretches west into the valley containing Cow Creek and Bridal Veil Falls. One of the lumps of Lumpy Ridge. The bushwhacking wasn't too bad for the most part. Nor was the climbing too crazy, though we certainly encountered some third to fourth class along the way. And here kids, is why you don't release balloons. They eventually come down somewhere. We packed the mess out. Lumpy Ridge does have several summits, with the high point being the western most lump. Here is the view back to Gem Peak from one of the other lumps. And east to the highest lump, The Needles, McGregor Mountain, and Mummies. If you look closely at the south side of McGregor (left in this photo), you'll notice a distinct gouge running down. The view south from a cool little keyhole. On the highest lump and yet a little bit closer to The Needles. And finally on the summit of The Needles. Here is a closer look at McGregor Mountain. It looks rather steep, slabby, and exposed. And it was! Ypsilon and Fairchild as seen from The Needles. Dark Mountain and Mummy Mountain. The entirety of Lumpy Ridge from the high point of The Needles. South to the tallest peaks of the park, and those lying on the continental divide. McGregor Mountain again. Looks even more improbable. We descended towards Dark Mountain, aiming to hit the saddle between it and Lumpy Ridge to avoid more gain on the Black Canyon Trail. Finding the waterfall! It couldn't have worked out better. We knew the trail down from here was relatively flat. Remember than channel gouged out of McGregor Mountain? Here is where it ended up. Dan in the photo for perspective. Mind blowing to see this. Particularly since this is what it looked like last year. A peaceful five foot wide and two feet deep creek. Well, that took care of the trail back. We headed uphill to remeet the Lumpy Ridge Trail, crossing a mudslide and various other washouts along the way. When we got back to the trail, we saw the first real signs of damage. Some washouts at small drainages and deep ruts in the trail from water running down it. It's all passable though. Lumpy Ridge from below. Here the lumps look higher than the needles. I always like being able to see where I was earlier from the bottom. We got back to the truck at two thirty, giving us a nine hour day. That didn't feel too bad in relation to all of the off trail hiking. I passed Dan my camera and asked him to take pictures of anything he felt was interesting on the way down. Of course shooting out of a moving truck with dirty windows didn't give me much to use! Estes, at least where we were, didn't look too bad though you could see signs of damage all over the place. Lake Estes was being worked on- a ton of sediment washed down. Now illuminated, 36 was very visibly damaged in places. The businesses and homes along the creek were ravaged, and the level of destruction is incomprehensible. It is one thing to see the photos and video on the news, but another to see it in person. 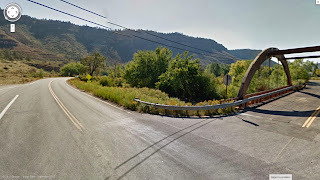 In some places, you can see where the road used to go versus where it runs now. While things are opening back up, the clean up is obviously going to last well into 2014 if not 2015. You can see where the high water mark was in relation to the homes along the creek. Alot of them were underwater. Here was one of the most visible reroutes of 36, not too far above Lyons. All the orange marks where the road used to be. This is as close to the same view as I could get from Google Maps pre-flood. Pretty astounding. The road now goes out left rather than taking the straighter curve. The drive back through Lyons provided a sobering end to the day. It is great to see people returning to their homes and places rebuilding and things returning to normal. But there is still alot of work to be done. As a cancer survivor, it makes me thing of returning to normal after treatment. Things won't be the same as they were, but there is a new normal to be found. Of course this was a fun return to the park. As probably evidenced by this very existence of this blog, this is a place I love, and a place I have sorely missed the past two months. This hike was a good way to get back to it, offering great views all around. On paper this hike doesn't look too bad, covering tenish miles with a maximum gain of 2216 feet. But there is alot of up and down, bushwhacking, and scrambling. Just how I like it! Gem Lake, 8820 feet: 1.7 miles each way, 968 foot gain. Moderate-. Gem Peak, 9140 feet: 1.8 miles each way, 1288 foot gain. Moderate+. Up to third class. The highest lump, 9821 feet: 4ish miles each way, 1969 foot gain. Strenuous-. Up to fourth class. The Needles, 10068 feet: 4.3ish miles each way, 2216 foot gain. Strenuous-. Up to fourth class. MacGregor Falls, 8380 feet: 3.2 miles each way, 528 foot gain. Moderate-.